Eco-friendly PLA Filament: Compared to ABS filament.Our WESEN 3D Pen Filaments are more safer for kids when they are drawing. Ultra-Smooth: Our 3D printing pen filament is made of high quality PLA material, which is always round, with no oily residue or breaks. It can produce well lines and bright colors without bubble. 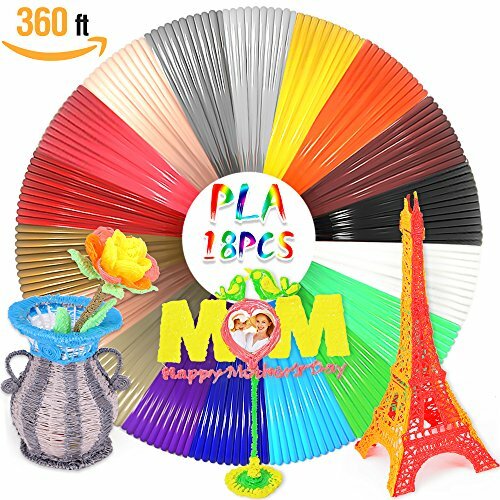 18 Unique Colors: These 3D drawing filament refills pack comes with 18 different beautiful colors to give you more options when creating your artistic master piece. Compared with the 20 or more colors ,we save the more similar colors and give you a better price. Wider Compatibility: Universal 1.75 mm dia (with dimensional accuracy +/- 0.05 mm) makes these 3D Pen filament Refills compatible with a wide range of 3D pens, including popular brands like MYNT3D, Manve, Canbor, Tecboss, TRLife AIO, etc. 100% Guarantee: We are so confident to our product quality and stand behind it 100%, please don't hesitate to contact us if you have any question we will promptly and courteously offer you a full refund or send a new replacement. Are you looking for filament refills for your 3D pen? Come on!! !you can try our 3d pen filament refills if your 3d pen accepts 1.75mm diameter filament. Comes with 18 different necessary colors for you to create your handcraft.